Nearly Legal was brought up with chickens (not by chickens – a vital distinction. No poultry played a parental role at all. Oh no). After decades, and not a little intensive therapy, the metaphorical, if not the literal, scars seemed to have faded. Immersed in housing law, NL thought himself safe. But no longer. Thanks to the dastardly efforts of some litigants in person, not even housing law is chicken-free. Natasha Brooks and her cousin Stuart Cole (for the guilty shall be named), of Manchester, foiled the brave attempts of her landlord, New Charter Housing Trust, to stop her keeping two hens in her garden. New Charter took the view that the hens, named Henny and Penny, were not allowed under the tenancy agreement. 12 Abolition of contractual restrictions on keeping hens and rabbits. Provided that nothing in this subsection shall authorise any hens or rabbits to be kept in such a place or in such a manner as to be prejudicial to health or a nuisance or affect the operation of any enactment. To my horror, this provision has not been repealed. Nor does the Act define lease, tenancy or land in such a way as to limit it to allotments. Posted in assured-tenancy, Housing law - All, Possession. I am saddened to note that you are posessed of extreme chicken phobia, though I quite understand why – many has been the occasion, since the arrival of the girls Chez Minx, that I fear that I am being made the subject of the sort of well organised conspiracy in which your local and bog standard Anarchist would feel an immense sense of pride. This said, I am provided with a goodly supply fresh eggs for brekfast, now that they all seem less stressed following their release from battery hell, and have even started to grow feathers such that they no longer have to wear their stripy, woolly jumpers. In short, I would like to state I believe that I have made the right decision in adopting battery hens, and am pleased to see the law supports me in this endeavour. Indeed, Iam generally content that we are all getting along very well, and that the keeping of hens is actually a very good thing. Animals often have walk on (and occasionally hop on) roles in Traveller cases. 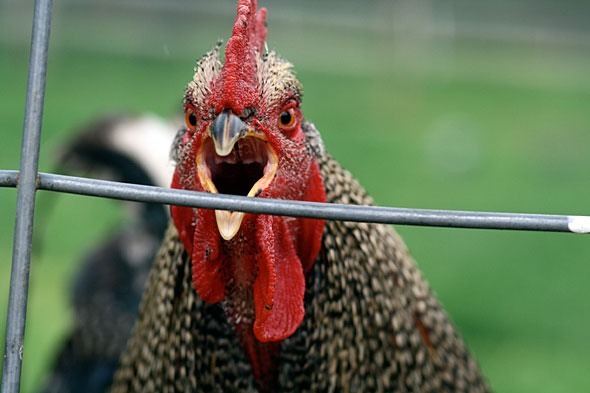 indeed I currently have a case involving (alleged) nuisance by chickens ( running out on the road – in case you think they’re really big chickens terrorising the neighbourhood). one is quite upset at the apparent narrowmindedness [or is battlescars from childhood]displayed by NL. it was never intended to apply just to allotments. further it doesnt authorise keeping them when it causes a nuisance. ther is a tendency over the last 10 years for Social LLs to ban tenants from doing this and doing that in their homes. reversing the movement in the late 70s and 80s to free tenants from petty restrictions in their homes and relying on nuisance and annoyance. However thank you for bringing attention to s12 to a new generation of housing lawyers. No need to be upset. I’m not really chicken-phobic, nor am I aghast at the survival of the Allotments Act. I’d hoped the general tone of hyperbole would make clear the approach was a joke, but obviously it didn’t. S.12 is a curiosity from the time of rationing, though. I’d have thought that private sector tenancies, with their fairly universal ‘no pets’ terms would be more affected (so long as the pet was a rabbit or hen). Giles, (or any other legal eagle) is this real? I’m being threatened with eviction for keeping chickens in a HA garden does AA1950s.12 really apply? Has anyone tested it in court? It is good law. So long as not a nuisance to others or prejudicial to health. Only applies to hens and rabbits though. Not cockerels, for example. yes, I only have hens, you may have saved me! Happy new year!